Every year, more than 4,000 workers die on the job and nearly four million workers are injured or made sick at work. Workers' Memorial Day is held on April 28 to honor those workers and renew the commitment to protect the safety and health of all workers. Regional OSHA offices, worker organizations, and individuals affected by these tragedies will hold events to honor workers across the country. For a full list of events, and to find one near you, visit the Workers' Memorial Day webpage. In the last five years, 64 people employed in the landscaping industry died of workplace injuries in Alabama, Florida, Georgia and Mississippi. 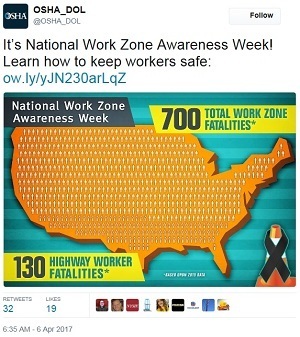 To bring attention to the hazards in landscaping, OSHA is teaming up with industry associations and employers to sponsor one-hour Safety Stand-Downs at worksites this week, during which supervisors and workers take a break to learn about potential hazards, including falls, being crushed or hit by objects, or electrocuted. The Associated General Contractors of Georgia, area employers, and OSHA are sponsoring the events. For links to training materials and other information, see the news release. Falls remain the leading cause of death in the construction industry and lack of proper fall protection is still OSHA's most frequently cited violation. 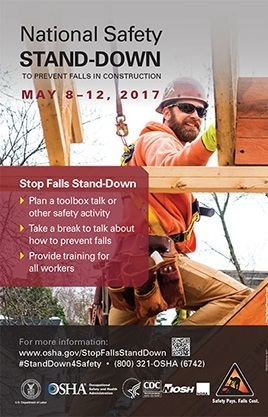 To raise awareness of fall hazards, the Occupational Safety and Health Administration, the National Institute for Occupational Safety and Health and the Center for Construction Research and Training will hold the fourth annual National Safety Stand-Down May 8-12. The weeklong event encourages employers to pause during their workday for topic discussions, safety demonstrations, and trainings in hazard recognition and fall prevention. In Washington, D.C., two prominent construction venues – at the mile-long waterfront development known as the Wharf, and the Capitol Riverfront area near Navy Yard – will participate with large-scale stand-downs in the week leading up to the official stand-down. For more information, see the event webpage. 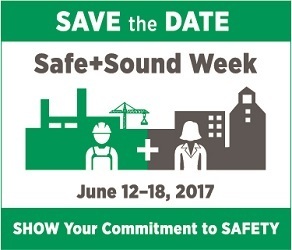 To help employers participate and plan events for Safe + Sound week, June 12-18, OSHA has updated its webpage with sample activities, social media resources, and tools. The page also features an interactive map of events occurring across the country. Employers are encouraged to host events and activities that showcase the core elements of an effective safety and health program – management leadership, worker participation, and finding and fixing workplace hazards. Visit the Safe + Sound Week page for more information and to register events. OSHA announced it will delay in the enforcement of the crystalline silica standard in construction from June 23 to Sept. 23. The three-month delay will allow for more outreach to be conducted and guidance provided to employers. The compliance deadlines for general industry and maritime, set for June 2018, remain unchanged. For more information, read the news release. 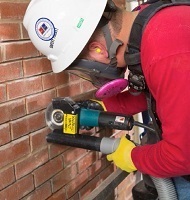 The Associated Builders and Contractors-Pelican Chapter renewed a five-year agreement to help reduce and prevent exposures to struck-by, fall, caught-in-between, and electrical hazards. For example, in March 2016, the Alliance conducted a free “Safety Revolution” training seminar that addressed hazards in the construction industry. The Associated General Contractors-Rio Grande Valley Chapter signed a two-year agreement to help protect the health and safety of construction workers, particularly by reducing and preventing exposure to fall, electrocution, struck-by, and caught-in or between hazards. OSHA's On-site Consultation Program offers free and confidential occupational safety and health advice to small and medium-sized businesses on compliance with OSHA standards, and assists in establishing safety and health programs. Employers who have used OSHA's consultation services and operate an exemplary safety and health program may be accepted into the agency's Safety and Health Achievement Recognition Program. US Drop Forge, a Woolwich, N.J., manufacturer in the high-hazard heavy metals industry, first earned SHARP status in 2014 after making significant improvements to its confined space and electrical safety programs with help from OSHA consultants. The company renewed its SHARP status in 2016 after going three consecutive years without a lost-time injury. At the same time, the company's productivity and profitability have increased, along with profit sharing distributions to its employees. For more information, see US Drop Forge's success story. The non-profit East Texas Lighthouse for the Blind, in Tyler, Texas, recently earned SHARP status after the organization dramatically decreased workplace injuries. As a result of guidance from OSHA consultants, it’s been three years since an ETLB employee last sustained a reportable workplace injury. For more information, read the success story. The Washington State Department of Labor and Industries, the Washington Employment Security Department and the U.S. Department of Labor will host training forums in Yakima on April 26 and Wenatchee on April 27 for agricultural supervisors and crew chiefs who supervise immigrant workers. The free half-day sessions, provided in English and Spanish, cover topics including wage and hour requirements, workplace safety and health regulations and workers' compensation claims. For registration and contact information, see the news release. Two employees died when the 12-foot-deep trench in which they were working collapsed, breaking a nearby fire hydrant supply line and filling the trench with water. OSHA inspectors found that Atlantic Drain Service Co. Inc. and its owner, Kevin Otto, failed to provide basic safeguards to prevent a trench collapse and did not train employees to recognize and avoid cave-in hazards. Other violations included failing to: provide a ladder so employees could exit the trench at any time; support other structures near the trench that posed overhead hazards; and supply hardhats and eye protection. The Boston-based company was cited for 18 safety violations and proposed $1,475,813 in fines. OSHA cited Atlantic Drain trenching worksites for similar hazards in 2007 and 2012. Read the news release for more information. America 1st Roofing & Builders Inc. was cited for multiple violations after four separate safety inspections found workers exposed to falls of more than 30 feet. The Washington State Department of Labor & Industries cited the Mukilteo, Wash., roofing company for 21 violations that include failing to require fall protection equipment, develop a safety program and have someone trained in first-aid at the worksite. The company has been cited for fall protection violations multiple times in the last three years. For more information, read the news release. OSHA conducted an inspection of Chestatee Regional Hospital in Dahlonega, Ga., after learning that a worker broke her hip when she slipped and fell while cleaning a room. The worker's employer, cleaning contractor Healthcare Services Group Inc., was cited for eight violations of workplace safety and health standards. Violations included not providing dry standing places or mats for workers cleaning and waxing floors, and not providing personal protective equipment to prevent exposure to hazardous chemicals. For more information, read the citations. OSHA cited Master Carpentry Inc. after inspectors observed the company’s workers exposed to fall hazards at two construction sites in Washington, D.C. In the first incident, two workers on the roof of a large residential structure were seen wearing personal fall arrest equipment that was not tied off to secure anchor points. In a second incident six days later, a worker was seen standing on the flat roof of a three-story row house with no fall protection. Master has been cited for fall hazards multiple times in the past five years. 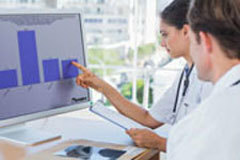 The National Institute for Occupational Safety and Health has established a web-based injury and exposure monitoring system available at no cost to healthcare facilities. This secure system enables participating facilities to analyze worker injury and exposure data that they already collect. Trends for traumatic injury and hazardous exposures are visualized using a chart function. The system allows facilities to track five common work-related injuries and exposures in healthcare: sharps injuries; blood and body fluid exposure; slips, trips, and falls; patient handling injuries; and workplace violence. Visit the OHSN webpage for more information and to begin the enrollment process. OSHA reminds employers of their obligation to post a copy of OSHA's Form 300A, which summarizes job-related injuries and illnesses logged during 2016. The summary must be displayed from February through April in a common area where notices to employees are usually posted. Businesses with 10 or fewer employees and those in certain low-hazard industries are exempt from OSHA recordkeeping and posting requirements. QuickTakes is emailed free twice monthly to more than 175,000 subscribers. You can receive it faster and easier by subscribing to the RSS feed that delivers almost instant information. Visit OSHA's RSS Feeds Web page to subscribe.